Home / TOP STORY/ Digana turns divisive! 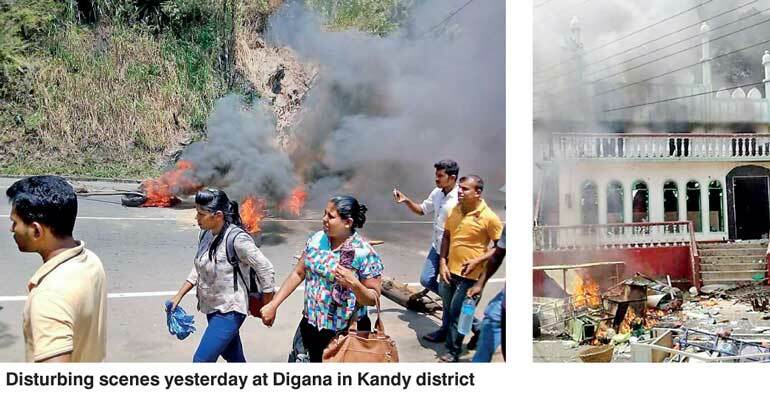 The Government yesterday deployed 200 Special Task Force (STF) personnel and declared special area curfew in Digana in the Kandy District, after mobs attacked shops and places of religious worship in the Muslim-majority town. Some 27 Muslim-owned shops and businesses and several houses were set on fire, while at least one mosque was damaged during the overnight violence that spilled over into yesterday. Twenty-four persons were arrested by Teldeniya police in connection with the violence. President Maithripala Sirisena called for calm and demanded an independent police inquiry into the Digana violence. President Sirisena also urged law enforcement agencies to ensure the safety and security of residents in the area. In a statement last night, the Government Information Department said police had been placed on high alert to ensure the law is enforced and the situation does not spiral into an inter-communal conflagration. The suspects had been arrested, the Government Information Department added, calling for calm. Police fired tear gas to disperse crowds that surrounded the Teldeniya police station following the arrests of the rioters and eventually declared curfew in the Kandy administrative area in order to restore calm. The special police curfew will remain in effect till 6AM today, and is likely to be extended police said. All Government schools in the Kandy Administrative district were also declared closed in the wake of the riots, Education Minister Akila Viraj Kariyawasam announced. “We imposed the curfew as the violence was spreading and was becoming difficult to control and there was clear evidence that outside influence was instigating the violence,” Sri Lanka Police Spokesperson Superintendent of Police Ruwan Gunasekara told Daily FT.
“We have already sent Army soldiers to Digana, Teldeniya and Kandy town areas, and we have also put more troops on standby as requested by Police,” Brigadier Sumith Atapattu told Daily FT.
Reports from the area, including from Teldeniya police, said the violence appeared to be a reprisal for a dispute involving the assault of a Sinhalese man by four Muslims that happened over a week ago, which eventually took a communal turn. The incident that sparked violence on the streets of Digana occurred on 22 February, when a 42-year old Sinhalese man was brutally assaulted for attempting to overtake a three wheeler. After nearly 10 days in the Intensive Care Unit of the Kandy General Hospital, the man succumbed to his injuries on 3 March (Saturday), correspondents in the area said. All four accused, who were immediately arrested and remanded until 7 March, hailed from Digana town, the reports said. The funeral of the victim was held yesterday and likely triggered the violence, police reports coming out of the area said. The man who had been killed in Teldeniya was the sole breadwinner of his family and a hard worker, said Hamzah Rahmath, a social worker in the area. The incident on the road had been over a three-wheeler side mirror, Rahmath said. The accused in the killing had been intoxicated, the social worker added. “Now the whole community is in trouble because of their mistake,” Rahmath said. After hours of rioting and burning, the town of Digana looked war-struck in images and videos emerging from the area. Tyres were set on fire on the main streets, sending clouds of thick black smoke into the sky. White funeral flags swayed in the wind above the smoke and flames rising from the streets. Controversial Bodu Bala Sena General Secretary, Ven. Galagoda Aththe Gnanasara Thero, whose presence at these scenes of communal tension often becomes a catalyst for escalation, visited the home of the victim in Teldeniya on Sunday (4 March) night. However, the Buddhist monk had urged people at the funeral house to remain calm and not engage in unnecessary clashes, BBS CEO Dilantha Withanage told Daily FT. The Bodu Bala Sena would hold a press conference about the incident in Digana today, he said. Industry and Commerce Minister Rishad Bathiudeen told Daily FT that he and other Muslim politicians had warned the IGP and the DIG of the area that tensions were escalating in the Digana and Teldeniya areas and urged them to take action to ensure the protection of residents in the area. “They told us to tell Muslims to stay at home and close up their shops in Digana. So Muslims stayed at home. The mobs set fire to the deserted shops,” Minister Bathiudeen complained. Bathiudeen added that he had spoken with the Prime Minister and he had assured STF and Police protection in Digana and surrounding villages, and even said the army would be sent in for additional security. “What message does it send to minority communities when their houses and businesses are burnt in front of law enforcement officials?” the Minister said in a telephone interview while travelling to the affected area last night. Sri Lanka Muslim Congress Leader and City Planning and Water Supply Minister Rauff Hakeem, who also toured the affected areas last night, blamed the Police for “total lethargy and intransigence. Every time this type of violence unfolded, the police are failing at the local level,” he told Daily FT.
“This is a very clear hate crime pattern now,” Hakeem said, adding that the mobs appeared to be newly enthusiastic ever since the election victory of the SLPP. “As ministers in this Government we are distressed and embarrassed. After all we brought this Government to power promising the people that the problems from the past would not be repeated,” Minister Hakeem said. He blamed both Gnanasara Thero and controversial Batticaloa Sri Mangalaramaya monk Ven. Ampitiye Sumanaratna Thera for travelling to Teldeniya on Sunday and inciting the unrest. Sumanaratna Thera was also at the scene when mobs became unruly outside the Teldeniya Police Station. “Enough is enough,” tweeted Media Minister Mangala Samaraweera last night, posting pictures of the violence in Digana. “Inciting racial violence must be made a non-bailable offence and politicians who give leadership should have their civic rights revoked,” he demanded. Former President Mahinda Rajapaksa also weighed in on the violence in Digana, saying doubts had been raised if the police had acted swiftly to control the situation. “This is a moment for being calm and reasonable,” he told reporters last night. Centre for Human Rights (CHR) too raised questions over the failure of the Police to curb the situation, despite clear indications that tension has been building up since the death of the assault victim on Saturday. Issuing a statement, CHR Executive Director Rajith Keerthi Tennakoon stressed that despite attacks on several shops and houses on Saturday, the Police failed to take adequate measures to beef-up security yesterday, when the funeral of the assault victim was to take place. By sundown yesterday, the situation in Digana was mostly calm after the STF managed to control the violence. The Muslim villages of Madawela, Uguressapitiya and Udathalawinna had all been provided police protection in the wake of yesterday’s violence, police said. Kandy city itself remained largely peaceful, correspondents in the area said.